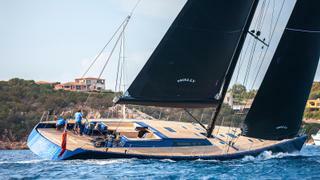 The 24 metre sailing yacht Inti3 has been listed for sale by Mario Velona at Ocean Independence. With naval architecture by Farr Yacht Design, Inti3 was built in carbon composite by Wally Yachts with exterior styling by Luca Bassani and delivered in 2005 as a fast cruising sloop. Her interior design, by Lazzarini Pickering, offers extraordinary height and plenty of deck hatches, portholes and windows for exceptional natural light and ventilation. The interior decor combines simple yet luxurious features including bleached teak wood for the joinery and lacquered ceilings and walls. Inti3 was originally built with only two guest cabins sleeping four guests, but in 2017 she was refitted to offer more accommodation. She can now accommodate up to six guests in three cabins, with the master suite located amidships. This is the most comfortable position when underway as pitching and rolling sensations are kept to a minimum. The master is equipped with a queen sized bed, an office and an en-suite bathroom. The second and the third newly added guest cabins each have twin beds and en-suite bathroom facilities. A further two cabins can sleep up to four crewmembers aboard this yacht for sale. On the performance side, she easily reaches ten knots of speed upwind in eight knots of breeze. Her cruising comfort is enhanced by simple operation with an in-furling boom and a furling, self-tacking jib. Inti3 has a clean profile with flush desks and all main halyards and sheets running under the deck. Under power, a 250hp Cummins diesel engine allows a cruising speed of 19 knots. Lying in La Spezia, Italy, Inti3 is asking €3,800,000 with VAT paid.